The Frost School of Music at the University of Miami presented The Miller Family with the 2017 Frost Legacy Award in recognition of their generous philanthropy to education and the arts in South Florida. The Miller Family has left an indelible mark on the University of Miami with gifts totaling over $200 million since 2004, including $5 million in 2016 to the Frost School of Music. 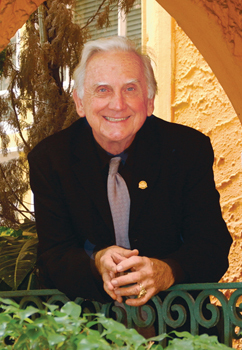 Leonard M. Miller, former chair of UM’s Board of Trustees, built a prominent homebuilding company with an investment of his own capital that ultimately became Lennar Corporation, one of the nation’s leading homebuilders and providers of residential financial services. When he passed in 2002, Susan “Sue” Miller became the torchbearer of her family’s boundless generosity. The University of Miami Phillip and Patricia Frost School of Music presented Dr. Richard and Mrs. Carin Krasno with the 2016 Frost Legacy Award in recognition of their generous support of the Donna E. Shalala MusicReach program. Richard and Carin represent an international love story. While President of the Institute of International Education, Richard met his Swedish-born wife during a trip to Sweden in 1991. She accepted his invitation to visit him in New York and the rest is history. 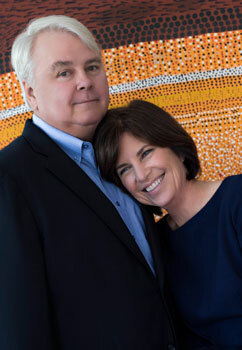 The University of Miami Phillip and Patricia Frost School of Music presented Debra and Dennis Scholl with the 2015 Frost Legacy Award at its annual Winter Wonderful holiday gala on December 6, 2015, in recognition of their advancement of the cultural arts landscape, both regionally and internationally. 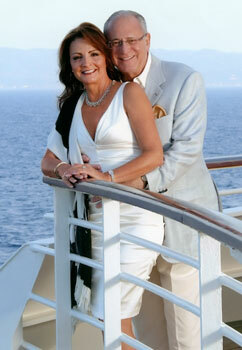 As contemporary art collectors, Debra and Dennis Scholl are renowned for their support of art, and artists. They are also highly regarded for their efforts to build the permanent collections of contemporary art museums. 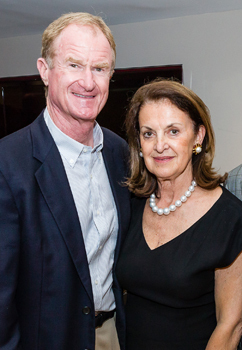 The University of Miami Phillip and Patricia Frost School of Music presented Swanee DiMare and Paul J. DiMare with the 2014 Frost Legacy Award at its Winter Wonderful holiday gala, in recognition of their inspirational philanthropy to the performing arts and dedicated service to the University. Paul J. DiMare is a member of the University of Miami Board of Trustees. Paul and Swanee are vice chairs of the University’s Momentum2 Campaign, and Paul is also Campaign Chair for Intercollegiate Athletics. 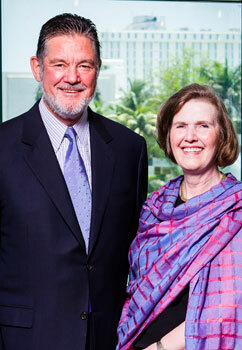 The Phillip and Patricia Frost School of Music at the University of Miami presented David R. Weaver and Dorothy Collins Weaver with its Frost Legacy Award during the 2013 Winter Wonderful celebration. The award acknowledged their inspired and dedicated service to our great music school, the university, and their noble support of the arts throughout our community. David R. Weaver is a senior trustee of the University of Miami Board of Trustees and is the Frost School of Music Momentum2 campaign chair. Michael S. Gordon, M.D., Ph.D. was the founder and Director Emeritus of the Michael S. Gordon Center for Research in Medical Education at the University of Miami Miller School of Medicine and Professor of Medicine (Cardiology). He had an international reputation as a pioneer in the delivery of more effective medical education through advanced computer-based technology and simulation. His programs have received numerous awards for their educational excellence and have had a major impact on teaching programs throughout the world. The University of Miami Frost School of Music presented its 2011 Frost Legacy Award to humanitarian Ginny Mancini on November 4th at the Adrienne Arsht Center for the Performing Arts in tribute to her transformative and inspiring support of the Henry Mancini Institute, the Frost School of Music, and other institutions of musical excellence throughout the world. The award was presented to Mancini when she attended a Jazz Meets Gershwin concert the month prior, co-presented by Jazz Roots, Festival Miami, and the Arsht Center. 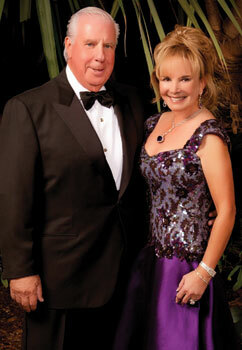 Ambassadors Chuck and Sue Cobb are longtime contributors to the University of Miami. Chuck has been a trustee for 40 years and has been the past chair of the Board of Trustees and the former chair of many of its committees, including Executive, Finance, Investment, Strategic Planning, Construction, and the Presidential Search Committee. 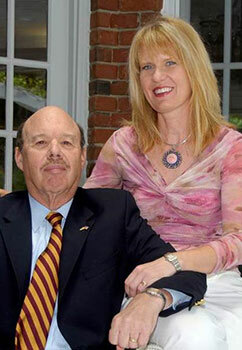 Sue is a graduate of UM School of Law and has been active on the Law School and Athletic Policy Committees. 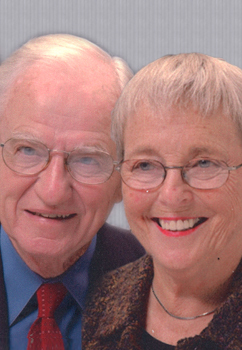 Their family has contributed over $4 million to UM such as Cobb Stadium and the Cobb Fountain. Many scholarships have been funded through their generosity. Marcus Lovett made Broadway history when he played the title role in Phantom of the Opera and Billy Bigelow in Carousel in the same week. He was in the original Broadway companies of Les Miserables and Aspects of Love, and starred in the West End in the Olivier Award-nominated, Whistle Down the Wind, by Andrew Lloyd Webber. His career has included recording, as well as roles in the film, and television. 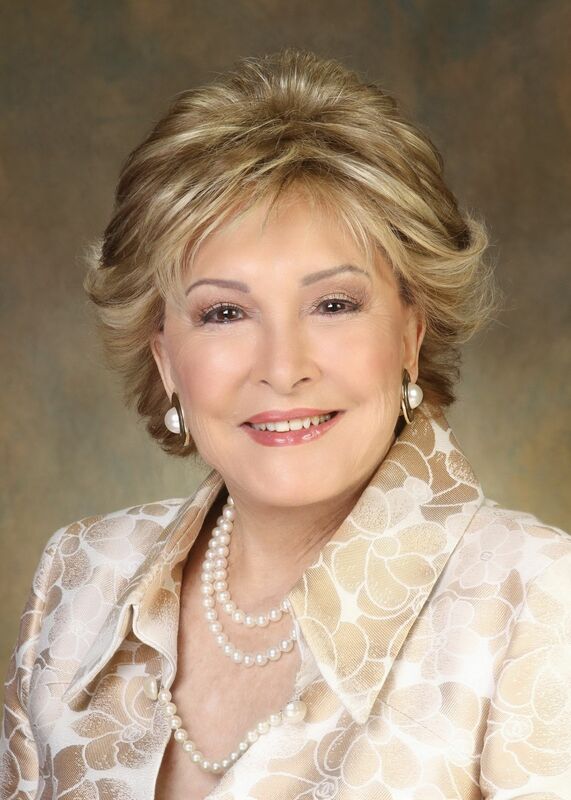 Past chair and senior member of the University of Miami Board of Trustees, Marta S. Weeks is a multifaceted philanthropist, loyal patron of the arts, community leader, speaker, and retired Episcopal priest. A member of the prestigious Iron Arrow honor society, she has provided primary support for several transformative facilities and programs at the Frost School of Music. 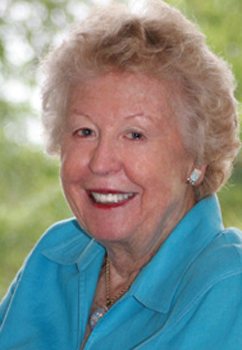 She was awarded the Frost Legacy Award in 2009 in honor of her generosity and kindness to the Frost School of Music. 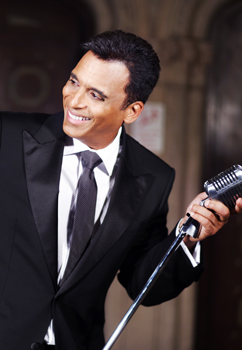 Frost School of Music alumnus Jon Secada, B.M. ‘83, M.M. ‘86, is a multi-Grammy-winning vocalist, inspiring performer, songwriter, producer, actor and engaging host of Latin American Idol who recently released a new CD, Expressions, which explores his jazz roots! Among many community service and charitable endeavors, he created the Jon Secada Music Scholarship at the University of Miami. In 2009 the Frost School paid tribute to the professional excellence of this marvelous musician with the Frost School of Music Achievement Award. 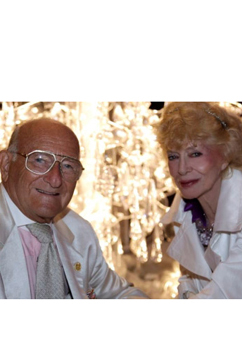 Dr. Sanford L. Ziff was the founder of Sunglass Hut International, Inc. He was born in Akron, Ohio and attended the University of Akron, the University of Miami and received his Doctorate Degree from the Northern Illinois of Optometry in Chicago, Illinois. He practiced Optometry in Miami specializing and doing clinical research in Contact Lenses. He has been published in most all Optometric and Ophthalmologic Journals in the United States and abroad where he has also lectured extensively. The Frost School of Music honored Roger J. Medel, M.D. and Virginia B. Medel, M.D. at the Frost School’s 2007 holiday dinner in honor of their generous commitment to the enrichment of the educational and artistic experiences of the students at the University of Miami. 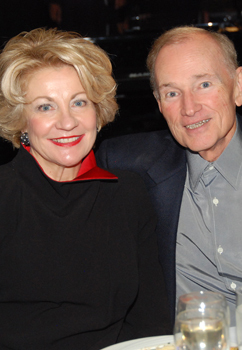 The Frost School of Music honored longtime supporter Jay W. Jensen at its 2006 holiday dinner for his commitment to the arts and cultural development to benefit the experienced of the students at the University of Miami. 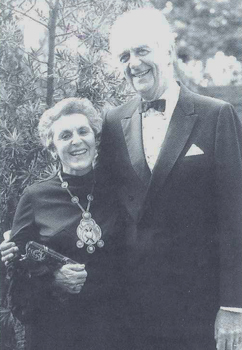 Roe and Penny Stamps were honored at the Frost School of Music’s 2005 holiday dinner. They generously support educational and artistic experiences at the Frost School School of Music through The Stamps Family Charitable Foundation. Committed to the enrichment of educational and artistic experiences for student scholars throughout the country, the Stamps Family Charitable Foundation Distinguished Visitors Series and the Stamps Family Charitable Foundation Music Scholarship Fund at the Frost School of Music are enriching the lives of our music students, and in turn, the South Florida community. 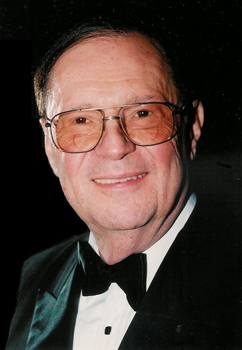 Dr. Lee “Doc” Kjelson (1927-2009), Professor Emeritus at The Frost School of Music, left a legacy of excellence in the professional field of choral music, having conducted and taught worldwide. Known for his compassion, devotion, and limitless energy, Kjelson touched many lives in his own unique way, striving for excellence, professionalism, and dedication to music throughout his career. 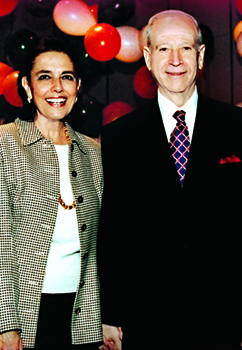 The Phillip and Patricia Frost School of Music honored the Gould Family at its 2003 holiday dinner for its long-standing leadership and continued generosity to the arts throughout South Florida. The University of Miami Frost School of Music was pleased to honor Dr. M. Lee Pearce for his long-standing leadership and continued generosity at the school's 2002 holiday dinner. 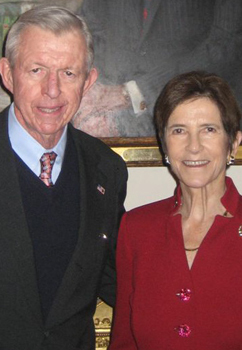 Dr. and Mrs. Phillip Frost have a longstanding tradition of involvement with UM with a total recognition of over $130 million, primarily to the Frost Institutes of Chemistry and Molecular Science and Frost School of Music. Their $33 million gift to the School of Music in 2003 was the largest ever given to a university-based music school in the United States; the school was then officially renamed the Phillip and Patricia Frost School of Music.